Dracaena, commonly called the “Dragon Tree” are a genus of 120 different species that predominantly come from Africa. 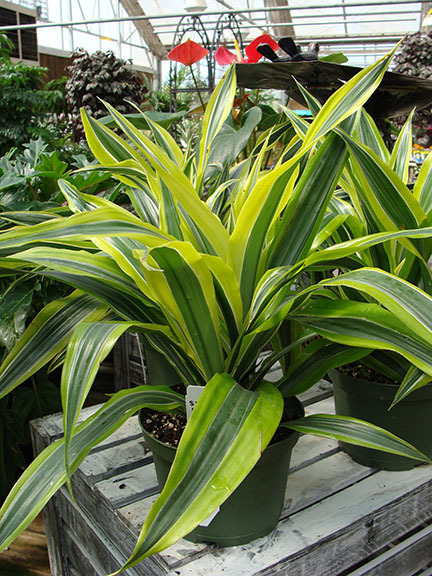 Lemon Lime Dracaena has 12”-24” long sword shaped leaves with bright green and yellow stripes. Like other dracaena plants, the leaves are arranged in a rosette and grow off a very thick stem. Because of the bright colors in the leaves, the dracaena lemon lime needs a little more light than other dracaenas. It’s a great plant to brighten up any room in your house. They can actually reach a height of 5’-7’ indoors, but can also be kept to a tabletop size with regular pruning. 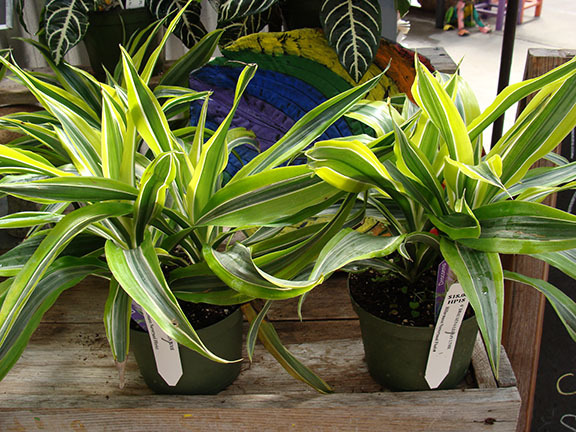 Although “Lemon-Lime” dracaena plants can produce blooms, they flower rarely as potted plants. The white flowers are more likely to blossom in summer if the plant receives a lot of bright light, but this amount of light may also prevent the foliage from developing its full color. Place your Dracaena where it will receive medium to bright indirect light. Too much direct sun will scorch and pale the leaves. However, very dim light could cause leggy growth, and browning. If your windows face South or West, be sure to place the plant behind sheer curtains or out of the direct stream of light. It’s important not to give your Lemon Lime Dracaena too much or too little water. Ideally the soil should be evenly and lightly moist, not soggy. If your planter has a drainage hole and saucer, then water it until it starts to come out the bottom of the pot. If the planter is sealed, you want to water the plant enough to saturate the soil, but not so much that water is building up in the bottom of the pot. If the soil remains too wet – or too dry, you will commonly see brown tips on the leaves. Feel the soil of your plant once a week, if the top 1”-2” is dry then your plant is ready for a drink. If the top 1”-2” is still moist, then check back in a few days. If the air where the plant is kept is very dry, use a humidity tray under or around the plant to reduce the chances of browning due to dryness. Most dracaenas really don’t require much fertilizer – only once or twice a year to keep them healthy (every six months or so). But if you want more growth, you can fertilize more frequently. Use any general-purpose houseplant fertilizer from your local garden center and follow the directions on the packaging. If your dracaena gets too tall and lanky, you can prune the top off. Most types will re-sprout and become bushier. Drying and browning of the lower leaves is common among Dracaena plants. Prune these leaves with a clean pair of shears to keep your plant looking it’s best! 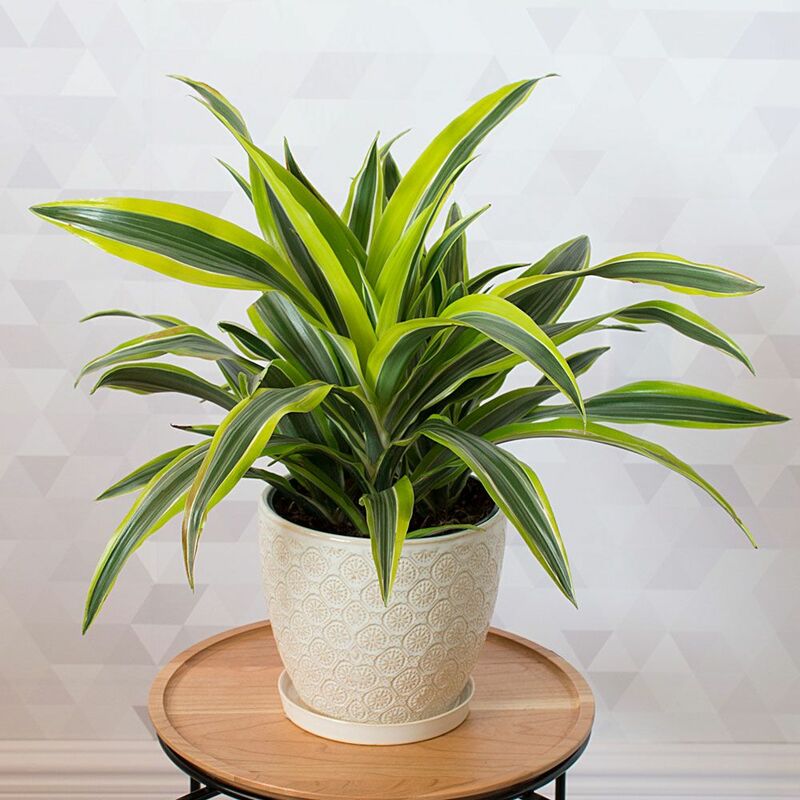 Regularly dusting the leaves of your dracaena will help it photosynthesize properly and keep your plant shiny! The NASA Clean Air Study indicated that the plant aided removal of indoor pollutants such as formaldehyde, xylene, and toluene. Dracaena plants are toxic to dogs and cats if eaten. Keep it in a location where curious pets will not have the opportunity to chew on or eat it. They are not poisonous to humans.